Axl and his wife Beatrice live in a medieval village in the aftermath of the Saxon wars. For some mysterious reason, they are not allowed to own a candle. They are also unable to remember past events. Rumor has it that a mist is responsible for this forgetfulness. One day, Axl and Beatrice decide to leave their village to visit their son, whom they haven’t seen in ages. They stop at a monastery because Beatrice has a pain in her side, and she thinks a monk living there can help her identify the source of her pain. A young boy named Edwin and his warrior friend Wistan join the couple because Edwin has been attacked by an ogre. The people living in his village think he’s cursed. The Buried Giant is set in an Arthurian universe in the style of the early Arthurian legends, but it is not an Arthurian retelling. While it is marketed as a fantasy, it is somewhat of a cross between T.H. White’s Once and Future King, and Umberto Eco’s Name of the Rose. 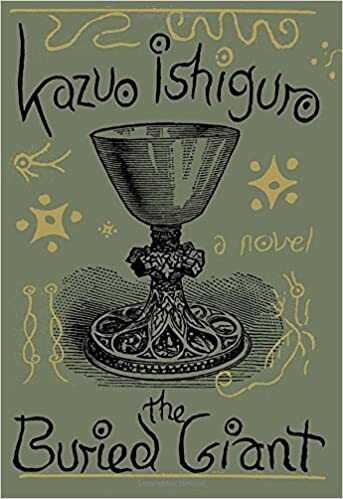 Kazuo Ishiguro’s novel is at once a fantastical adventure and a meditation on guilt, memory, and the collective stories we tell. For some reason, this book is marketed as a new Game of Thrones. No wonder so many readers have been disappointed by the story! Thankfully, I knew what to expect. After reading a few negative reviews of the book, it occurred to me that Ishiguro was trying to write in the style of the early Arthurian romances. As in those romances, all of the characters in The Buried Giant are one-dimensional, the dialogue is awkward, and the plot is outrageous. It seems to me that Ishiguro was trying to write an Arthurian tale through a postcolonial lens. Despite the medieval feel to the story, there is also something very modern in its approach. Unfortunately, I can’t go into more detail without spoiling the book. I’m a bit worried I’ve already said too much, but too many readers have been mislead by the blurb at the back of the book. I need to set the record straight. The Buried Giant was so atmospheric despite its outrageous plot and flat characters. I particularly loved the chapters that explored Sir Gawain’s thoughts. I was genuinely interested in each of the characters even though I knew that Ishiguro was giving us an allegory. The most off-putting aspect of the book was Axl’s relationship to Beatrice. He calls her “princess” all the time and often downplays his wife’s concerns. Was this meant to be a parody on the Arthurian romances of the 12th century? If you like books that explore memory and collective identity, I definitely recommend The Buried Giant. But be warned that this is no Game of Thrones.